Shimmerz Paints: Guest Designer Cari Fennell !!! Guest Designer Cari Fennell !!! We are so excited and honored to have this fabulous designer Guest Design for us! 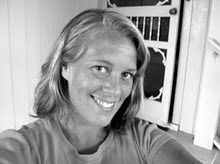 Please join me in welcoming Cari Fennell to the Shimmerz Blog! "I am so excited to be guest designing for Shimmerz this month. I had such an amazing time working with all of their gorgeous stuff! I can’t pick just one favorite-it is all awesome! But everything has it’s own personality which I love. The Shimmerz were perfect for painting my flowers-it went on smoothly and left gorgeous color and sparkle. The Blingz were even better-it left even more sparkle! The Spritz added subtle color and sparkle-perfect for a little shine on your projects. And let me just say the Vibez knocked my socks off! The color was bold and it’s almost like a paint that you can spray-except it’s still transparent. On my layout, I sprayed the background paper with Red-Y or Not Vibez. I applied it generously and then ran my fingers through the sprayed areas creating streaks of color wash. I also added Penny Pincher Vibez over the Red, creating more color streaks. 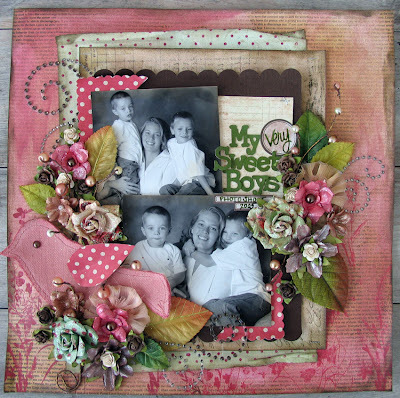 It blended together beautifully and really changed the look of the pattern paper I started with. I applied Royal Red Shimmerz to some white Prima flowers using a small paint brush. While the flowers were still wet-I scrunched the petals upward. Once they dried-they stayed like that! And I finished them with a spray of Penny Pincher Vibez. I did the same thing on smaller white flowers using Anitque Lace Shimmerz and larger flowers using Choc-O-Lat Shimmerz. I finished those with Penny P Vibez too. The Vibez also worked great on the Canvas bird. I sprayed different layers and let it dry before adding it to my layout. I dabbed the bird with paper towels after spraying it to give it a washed out look, like it’s aged a little in the sun. For my cards, I did the same thing with the flowers. I painted them with various Shimmerz colors and Blingz too! 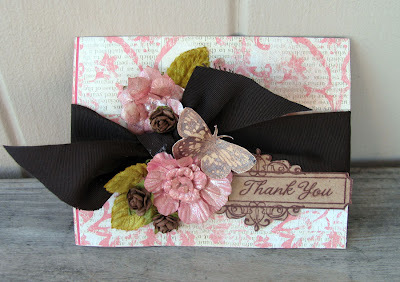 On the first card I painted the white Prima flowers with Pink Shimmerz and added a spray of Treasured Hymn Spritz. The pink went from bright to a vintage look. 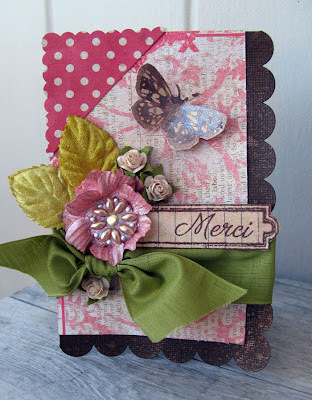 I painted the butterfly stamp with Cho-O-Lat Shimmerz and stamped it onto patterned paper. 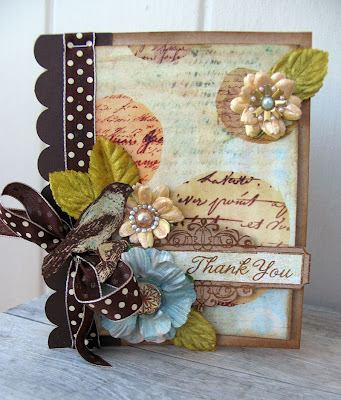 I cut out the image and added it as an embellishment to the card. I used a dye ink to stamp the label and sentiment. Then sprayed it with the same Treasured Hymn Spritz as well. The dye ink softened a little for an aged appearance. On the second card, I sprayed Penny Pincher Vibez onto the dark brown cardstock that I used as my card base. Then I added my patterned Prima papers and sprayed them as well. The top corner paper was punched as a square then cut in half. I painted the flower using Blingz and then I adhered a pearl center onto the flower once it was dry. (And it dried very quickly). The roses were sprayed with Penny Pincher and tucked into the ribbon bow with the larger flower. I added velvet leaves and my sentiment to finish it off. And the third card is one of my favorite I have made to date! I painted the two smaller flowers in gold Shimmerz and the larger one I sprayed using Sea Monkey Vibez. (I sprayed the vibez from a distance for a softer look.) Then all of the flowers were srayed with Treasures Hymn Spritz. The patterned paper was also Sprayed but there I used Penny Pincher Vibez and streaked by brushing my finger across the paper after I sprayed it. Thanks for stopping by and letting me share my creations with you! I had so much fun working with all of the Shimmerz goodies." Breathtaking work Cari!! Did I mention how adorable and sweet she is? ;) Thanks so much for Guesting for Shimmerz! To see more of her fabulous work, please take a peek at her blog here. Welcome, Cari! Your creations are beautiful! YAY Cari!!!! So, so pretty and so, so inspirational. Gotta go buy some Prima's . . . TODAY!!!! Thank you so much for sharing your talent with us. LOVE, love, love having you!!!! Beautiful Cari! Love, love your creations!!! Gorgeous work as always Cari! You are amazing! I love your work Cari!!! YEs, she is that sweet and talented! I agree with you, that last card is one of my favs from you! Gorgeous! STUNNING work as always, Cari! Cari this is beautiful I love your page this is very pretty. Thank you for working with us and Shimmerz products. Welcome, Cari! I've been a fan of your work for a long, long time! These are beautiful!!! Hi Cari!Welcome! LOVE your work! I really love what you created!